Example of test assembly for data measurements used to calculate apparent sound transmission class (ASTC) ratings. It is no secret multi-unit wood buildings are growing in popularity. A March 2018 article by Natural Resources Canada (NRCan) explains wood structures are easier to assemble, less noisy during the construction process, and produce less waste than other building materials. Wood structures are also not as energy consuming as other building types and create fewer pollutants over their life cycle than traditional construction materials. More and more Canadians are now opting for multi-unit buildings. According to the Canada Mortgage And Housing Corporation (CMHC), multi-unit starts have trended higher in recent months in most major urban centres while single-detached starts have declined. Architects and builders are keen to construct wood-framed, low- and mid-rise residential structures, as they are now permitted nationally through the 2015 National Building Code of Canada (NBC) and most provincial building codes. As a result, around 500 mid-rise buildings are in various stages of design and construction across the country. With standards and regulations on the minds of architects, specifiers, and builders, new, code-tested systems to help improve living spaces should be considered (Figure 1). Figure 1: Illustration of an innovative floor solution. One of the most important changes to NBC is the mandate for improved sound control between units and for rooms one above another supported by the addition of requirements for apparent sound transmission class (ASTC) ratings. ASTC is a better descriptor than sound transmission class (STC) of how well sound, fire, and odours are actually controlled in a building as it also addresses flanking transmission paths through the many junctions at the floor, ceiling, and adjacent wall assemblies. An STC requirement of 50 is still in place in provinces in the process of adopting NBC. The ASTC rating required by codes is a minimum of 47. A National Research Council of Canada (NRC) report identifies 55 examples using gypsum board as ASTC-alternative, code-compliant solutions. This is based on the tests the agency completed. 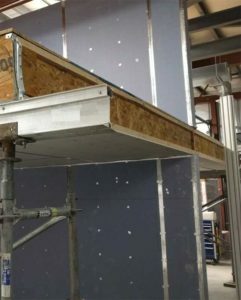 The report offers innovative alternatives to concrete toppings that can be applied to the floor of wood-framed buildings along with other materials to achieve better acoustics. 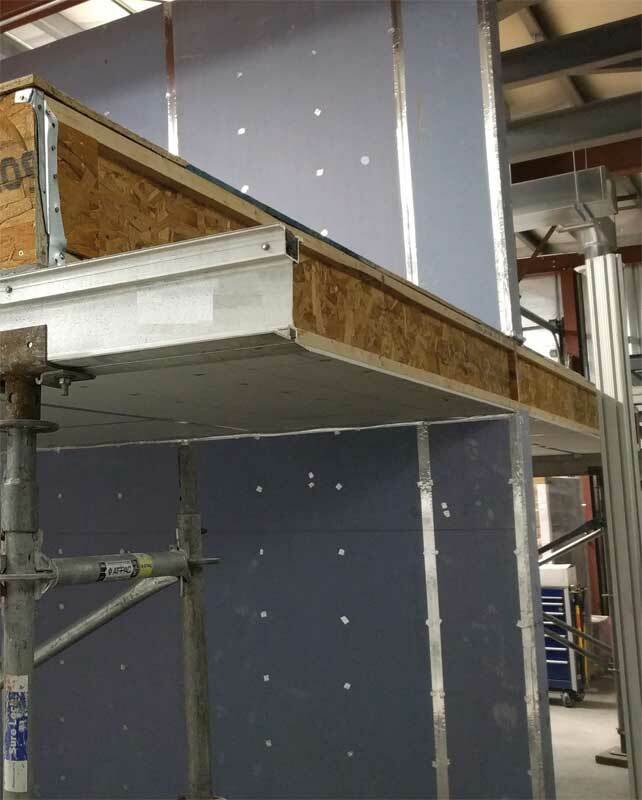 The examples in the NRC document are for innovative, proprietary, noise-reducing, single-layer laminated gypsum board and noise-reducing fibreglass insulation, which together reduce noise pollution between units and adhere to 2015 NBC’s ASTC requirements. An important point for specifiers, architects, and builders is the specific assemblies and installation details in the NRC report must be adhered to without substitution in the same manner as other tested sound and fire-rated assemblies. Construction must duplicate the illustrated design and the details included in the associated text to achieve the indicated ratings. Authorities having jurisdiction (AHJ) should be consulted before installation. There are various methods of demonstrating compliance with the new materials, including post-completion field testing or adopting the alternative code examples tested by NRC. Field testing post-construction is risky as failure to achieve the minimum sound rating may cause difficulties in obtaining an occupancy permit. To improve sound ratings to the code level, intrusive, costly corrective measures may be required, and finishes will have to be redone, not to mention likely disruptions of the living spaces. To ensure toppings do not damage the surroundings and materials susceptible to moisture, proper water dams must be installed around various fixtures, pipes, and walls for each individual project (Figure 2). This is expensive. Further, these dams are rendered useless once the project is complete as they are unique to each floor.